Welcome Motocross of Nations Fans! Morgantown, W. Va. (October 2, 2018) – The once-in-a-lifetime celebration of the FIM Monster Energy Motocross of Nations at RedBud deserves the proper spotlight, so Racer TV, the crew behind live coverage from Rocky Mountain ATV/MC National at Loretta Lynn’s and the Amsoil Grand National Cross Country Series, will present a ten-hour live showcase from the epicenter of this weekend’s race. 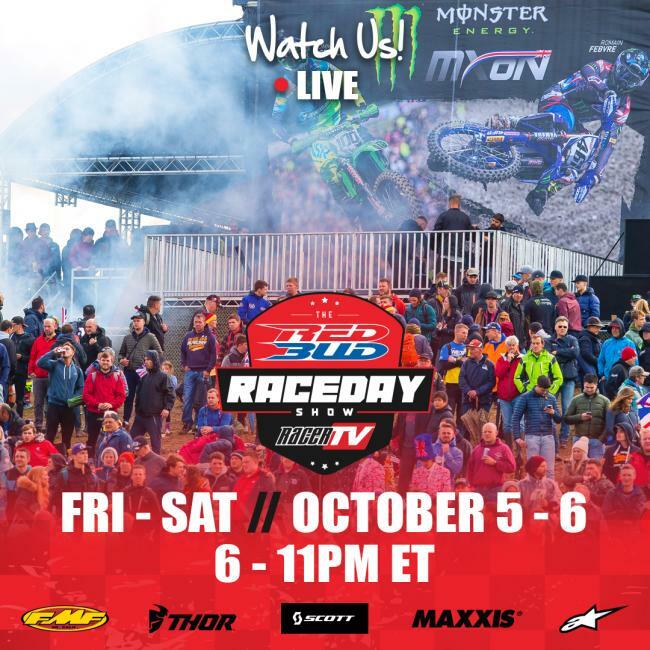 The RedBud Raceday Stage, powered by FMF, goes live from 6 p.m. to 11 p.m. local time this Friday and Saturday night, October 5 and 6, 2018. The RedBud fans are encouraged to join the excitement a la the famous ESPN College Gameday atmosphere at a football game, and those around the world can watch live each night on RacerTV.com. The show will be anchored by Jason Weigandt, Davey Coombs, Rob Buydos, Eric Johnson, Cotter, and Team USA superfan Matt “Megawatt” Watson, with industry insiders Steve Matthes and Jason Thomas stopping in for analysis and hijinks. A massive guest roll call is expected, including past Team USA members and a bevy of racers from the 2018 running of the race. The RedBud Raceday Stage sets up across from the RedBud night track, deep inside the camping grounds. Friday night’s show will focus on Jeff Stanton’s MXoN Experience at RedBud, a fundraising dinner featuring more than 40 former Team USA members. Stories will be told and bench racing will be had, and Raceday Stage will begin covering it with an exclusive red carpet ceremony that will include interviews with the past stars. Saturday night’s show will include coverage of the THOR Pit Bike of Nations, as well as analysis from Saturday’s qualifying races. The Raceday Stage, powered by FMF, is backed by THOR, Maxxis, Alpinestars, and Scott USA, with media assistance from Racer X and LeBigUSA.com. Stay tuned to @RacerTV for updates regarding the show, and bring your best to RedBud to make sure you get on the show! Established in 2011, Racer TV, is a West Virginia based production firm and broadcast network specializing in the creation of original powersports programming for television and Internet broadcast. Aired on NBCSN, MAVTV, and RacerTV.com, Racer TV features coverage of motocross and off-road motorcycle and ATV events.